You are currently browsing the tag archive for the ‘Oracle’ tag. Imagine that you are sitting in a great baroque theater filled with fashionable and cosmopolitan people from around the world. A hush falls upon the crowd and the house lights go out, plunging you into darkness. There is a palpable intake of breath from the audience, and then trumpets, oboes, French horns, violas, and that haunting musical saw (which is played like a violin but sounds like a warbling ghost) all launch into a dazzling overture which reminds you of the ocean. The music deepens and becomes more ominous and yet more lovely too: it is as though you were sinking down into the briny deep to the nacreous halls of Poseidon. The spotlight shines on the shimmering blue velvet curtain which lifts and behold! Today, after a long development period I present the Great Flounder! In your mind’s eye you can see the fish–a great behemoth lying on the bottom of the world ocean. Its body is pockmarked like an ancient asteroid. Its great fins are oddly transparent and yet occasionally they flicker to remind you the great sage is alive. Its eyes are huge glabrous pearls glistening in the watery depths—they are blank, yet they see all of the secrets of the ocean deep. If you dared, you could ask the fish a question about the past…about the present…lo verily, about the future itself—that unknowable realm which mortals cannot kin. Of course, long-time readers will know that I am a humanist and a rational thinker, so it is possible that this great oracular fish is really a toy, like the magic eight ball, the Ouija board, or the oracle bones. The Mermaid Parade on Saturday was the official launch (the parade was a huge success by the way). I always liked the magical eight ball, fortune cookies, and the fortune telling machine that gives out cards, but their answers were never quite what I wanted to hear. Instead of a bland platitude wouldn’t you prefer an enigmatic yet deep riddle of the sort one encounters in classical drama? For a long time, I sought until I found an oracle which gives such answers. Now you can ask all of your questions too. Regular visitors know that my alter-ego/spirit animal is the flounder (or, at any rate, the flatfish is definitely the leitmotif of this period of my ecology/history themed art). During lunchbreak or on the train I work on little “lesser” flounder drawings. In the near future I plan to put them all on a little internet store…along with some of the prints of the intricate flounder I have been drawing. Also there will be an interactive online flounder…it will all be the glorious artistic unveiling I have been hinting at for a while. You are going to love it!…erm…hopefully. In the mean time though, here are three of the most recent small flounder drawings I do during my busy Midtown days to keep from going crazy. The one at the top is some sort or oracle emerging from the underworld depths of the flounder itself. I don’t know what secrets this augur has…or even what gender they are, but they have brought unfathomable mysteries to light from the cave depths. A vile chef-beast lurks to the right roaring of appetites which can never be sated, while, at left a young mother nurses an infant: the next generation arises to take a place within the great weal, yet always there is appetite. Speaking of which, this second flounder is meant to evoke the ifrits which always pop out of of ancient middle eastern oil lamps. A mysterious world of gauzy spirits, mystery beasts, and apparitions swirl around the lit lamp, but whether any of these blue spirits offer helpful advice or magical munificence is unclear. Finally, I made a flounder which represents the bloodstream (my very first readers will recall that I had a childhood epiphany about the nature of living things based on blood). The cells stream forth to build the organism and carry out needed maintenance, but strange viruses swirl within the plasma. most ominously a parasitic tapeworm stares in hunger at the feast of little lives. It is unclear whether the aristocratic woman is a parasite or whether she is the host. This is a whole little ecosystem with the long-suffering flounder in the middle. I will add all of these flounder to my Instagram feed (which you should follow), but you can see them here first, and read the perplexing explanations I have offered. A quick artistic post today: this is “Ein Augur erklärt Numa Pompilius nach dem Orakel des Vogelfluges zum König” by Bernhard Rode. It is an engraving made between 1768-69. Look at how beautifully it evokes the mystery of the classical world and reflects the Rococo German fascination with lovely melancholy classical ruins. Also notice the augur’s trademark lituus. Everyone knows about the Oracle at Delphi—one of the most important sacred places of the classical world. Delphi was sacred to Apollo and it is where (in mythology) he slew the ancient giant python which vexed he and Artemis and donned the mantle of god of prophecy. However there was a much older oracle sight in the classical world. According to Herodotus it dated back to the second millennium BCE and Aristotle regarded it as the birthplace of the Hellenes (which is to say the origin point of the Greeks). It was arguably the second most important place of prophecy in the ancient Greek world. This was the great oracle at Dodona in Epirus. Archaeologists indeed date cult activity at the site back to the Mycenaean age. I found pictures of the great theater at Dodona (above) which is certainly awe-inspiring, and of the council house, where affairs of state were adjudicated, however I could not find pictures of the oracle. Perhaps it was a victim of Christian zeal, or maybe it just doesn’t photograph so well after 4000 years. Long-time readers know I am interested in dove iconography: it is one of the shared aspects of Hellenic pantheism and Judeo-Christian imagery (sharp-eyed readers will also note that a sacred oak appears into the story). I wish I could have found an ancient vase with the Dodona story on it–but maybe it just didn’t translate into pottery. At any rate we will keep featuring these prophetic stories–they are leading up to an exciting surprise at the end of summer! Thanks for bearing with me during last week when I took a much-needed break from blogging. Sadly, it does not seem like misinformation, social manipulation, distortion, and outright fabrication took a break during Ferrebeekeeper’s absence…they are more popular than ever! So I have decided to get with the program and add a new topic much in keeping with this trend. Well I say “new”, but this subject is profoundly ancient and originated before cities or even agriculture. This ancient practice has always given people exactly what they want…often to their terrible detriment. If one is looking for chicanery, mendacity, wish fulfillment, and showmanship untethered from life’s hard truths (and a cursory look at bet-sellers, infomercials, politics, and society itself indicate that a lot of people want exactly that) then here is a subject I predict will suit perfectly: I am speaking of the ancient and manipulative art of PROPHECY! A prophecy is a sort of supernatural prediction about what will happen in the future (or a pretense of access to some otherwise inaccessible truth). The trappings of prophecy are many—entrails, crystals, special numbers, magical talismans, star signs, geomancy, demons, ghosts, gods and goddesses, etcetera etcetera. I hardly need to tell you that empiricists have never found any statistically meaningful evidence that such things work beyond the level of general platitudes (discounting inside knowledge and deception). Yet magical predictions endure and flourish in all societies. From the rudest hunter gatherer tribe, to the greatest globe-spanning empire, this “magic” has been present. Throughout history, oracles, scryers, prophets, augers, diviners, and astrologers have proliferated like, well, like human wishes. So why am I writing about this? Why do we need to look again at (sigh) astronomy and “The Secret” [spits] and at the ridiculous chickens of Publius Claudius Pulcher? First of all, as Freud knew, our wishes reveal so much about us—they provide a true dark mirror where we can see who we are with terrible clarity if we have the courage to really look. If prophecy does not necessarily have empirical merit, it often possesses immense artistic value. The essential dramatic truth of literature or scripture is frequently revealed in augury. The witch of Endor, the Delphic oracle, John the Baptist, and the witches in Macbeth set the action going (while at the same time foreshadowing/explaining how things will ultimately work out). But beyond the artistic merit of oracular truth, augury is related to prediction—the ability to think abstractly about the future and to shape outcomes by making intelligent choices based of guesses. I said that prophecy predated cities or agriculture (a breezy claim for which I naturally have no written evidence…although there are plenty of artifacts that are probably scrying tools and enormous amounts of similar circumstantial evidence): perhaps prophecy was a necessary step on the way to those things. Without being able to imagine the future, there is no need for seed corn or brickyards. The seeds to real inquiry can often be found in fantasy inquiry. Looking back across the breadth of history we see how religion became philosophy; geomancy became geology; astrology graduated to astonomy; even psychics and physicists have something in common. So follow along in this new topic. I confidently predict you will be surprised and delighted (and even if I am wrong we will at least have learned something). The Serpent Column is a stunning work of ancient Greek sculpture which is two and a half millennia old. It was cast in the early fifth century to commemorate the Greek victories at Plataea and Mycale which effectively ended the threat of Persian annexation. According to Herodotus, the column was made from the melted bronze armor and weapons of the defeated Persian army. It was set in front of the great oracle at Delphos to forever commemorate the power of Greek arms and to commemorate the 31 Greek city states which joined together to oppose the mighty Persian war machine. In its original form the 8 meter (26 foot tall) column consisted of three mighty snakes coiled together. On top of their bronze heads was a sacrificial tripod made of solid gold. During the Third Sacred War (356 BC–346 BC), the Phocian general, Philomelus, plundered the golden tripod and used the gold to pay for mercenaries (an act which was regarded as deepest sacrilege by the Greeks). When Constantine the Great declared Christianity to be the state religion of the Empire and moved the capital of the Roman Empire to Constantinople, he ordered that the column be removed from Delphos and relocated in the new capital city. The Serpent Column was placed at the center of the city’s great Hippodrome (chariot-racing track) among other famous statues of gods, kings, and heroes. Eventually the column was converted into a magnificent fountain and the missing gold tripod was replaced with a huge golden bowl. During the misbegotten fourth Crusade, when excommunicated French knights sacked Byzantium as they tried to get to Cairo, the gold bowl was carried off. 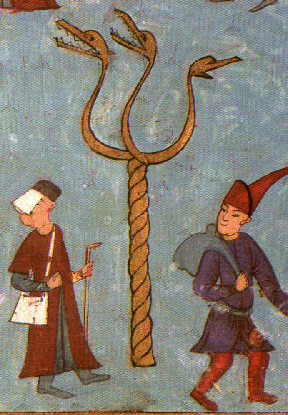 Sometime in the seventeenth century the three serpent heads which had topped the column for countless centuries fell off. Some sources contend that they were removed by an extremely drunken Polish ambassador, but more reliable Ottoman sources assert that they simply toppled off the statue. 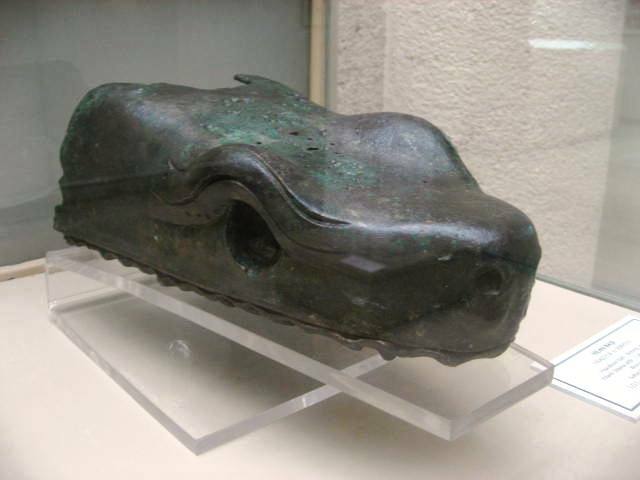 One serpent head still remains in existence in a Turkish museum. The column itself is still where it has been since the time of Constantine the Great, although the Hippodrome is largely gone and has been replaced by a square named Sultanahmet Meydani. Wake up, soccer fans! 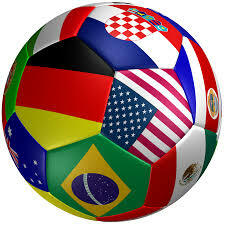 Today I will celebrate the 2014 FIFA World Cup Soccer Championship which is currently being played in Brazil. 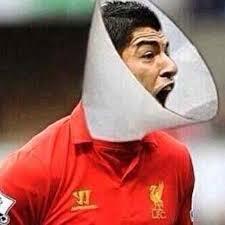 Well actually I was going to write about this year’s world cup tournament, but nothing interesting has happened so far except for that Uruguayan player who repeatedly bites people (and apparently he has already been captured, sedated, and returned to his native habitat without further human injuries). Since nothing exciting has happened in this tournament, I will write about the previous World Cup Soccer Championship Tournament which took place in South Africa in 2010. Unfortunately I don’t remember anything that happened on the pitch in South Africa. Clearly I was otherwise preoccupied…plus I am an American and we are famously obdurate in our inability to understand soccer (also we already have several dozen better sports to follow). Only two aspects of those matches stick in my memory: 1) the fearsome buzz of the vuvuzela, AKA “the devil stick”, a horrid musical instrument which first arrived on Earth inside a radioactive comet (probably because humankind failed to win a cosmic moral bet); and 2) Paul the octopus, a magical cephalopod who could predict soccer matches with greater accuracy than any of the world’s human pundits, psychics, and bookies. I believe that in-depth writing about the vuvuzela is now prohibited by international treaty, and I have nothing comprehensible to say about soccer (which seems to be a sort of agonizingly slow hockey with arcane kabuki-like dramatic conventions), but I would like to take a moment to eulogize Paul, who was not just a remarkable octopus but also a first-rate showman. Like soccer, Paul originated in England. In 2008, he hatched from an egg at the Sea Life Centre in Weymouth, England. Paul soon moved to Oberhausen, Germany, which, Wikipedia informs us, is an anchor point on the European Route of Industrial Heritage. Paul was a common octopus (Octopus vulgaris), a species known for intelligence, lively personality, tool-use, and acute senses. 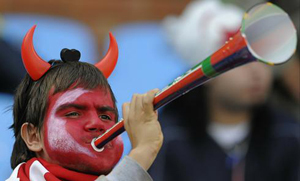 His oracular abilities soon became apparent during the UEFA Euro 2008 tournament. Before each match, Paul’s keepers would offer him two identical seafood treats in bags or boxes which were identical except for national flags of soccer playing nations. Whichever bag Paul chose to eat from first was reckoned to be his choice for match winner. 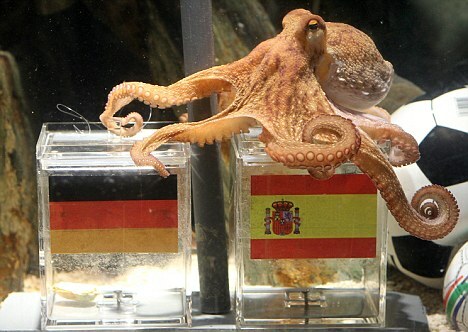 Paul was a German Octopus and initially he only voiced his opinion concerning German matches. He distinguished himself by correctly choosing the outcome of 4 out of 6 of Germany’s matches. But 2008 was only a lead-up to his remarkable World Cup predictions. During the 2010 World Cup, Paul correctly predicted every match which he was consulted about. This resulted in unprecedented world popularity (and infamy) for the tiny sea creature. Fans of the losing teams threatened Paul’s life, (which ultimately lead the Spanish Prime Minister to offer him state protection). The president of Iran denounced Paul as a symbol of Western Imperial corruption. The German press speculated that 2008 Paul had died and been replaced with a savvier octopus in 2010. PETA demanded that he be released to the wild (which would certainly have spelled the end of the aging tank-raised celebrity mollusk).